Free to enter new businesses after scrapping a non-compete pact with brother Anil, Mukesh Ambani on Friday unvieled RIL's mega plans for power and telecom to double enterprise value to $160 billion in 10 years, as also intent to supply gas to Anil Ambani Group's power plants. "As and when the power plants of ADAG are ready to receive gas, we would commence supplies to them subject to government granting allocation...," Ambani told shareholders at the 36th Annual General Meeting in Mumbai. RIL, India's most valuable company with a market capitalisation of Rs 345,000 crore, plans to use its strong balance sheet to fund coal, thermal and nuclear power plants, add capacity to produce polyester and chemicals to create "unprecedented value" for investors. Ambani, the richest man in Asia, said that RIL was ready for a "big surge forward" and will use its strong finances for "inorganic" growth in sectors like telecom. "It took three decades for RIL to create an enterprise value of over $80 billion (Rs 370,000 crore). I feel hopeful and confident that RIL can accomplish value creation of a similar magnitude in less than a decade," he said, while proposing 70 per cent dividend or Rs 7 a share for 2009-10. 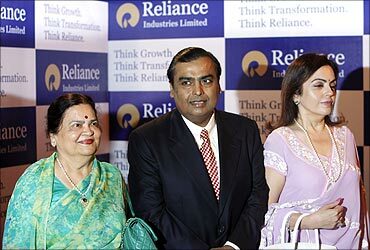 Addressing RIL shareholders exactly five years to the day when he and his brother Anil split the Reliance empire created by their father Dhirubhai Ambani, Mukesh, 53, signalled desire to end the feud with his younger sibling Anil. "With legal dispute (over supply and pricing of natural gas from RIL's Krishna Godavari basin fields to Anil Ambani Group's power plants) behind us, we look forward to a harmonious and constructive relationship with Anil Dhirubhai Ambani Group (ADAG)," he said at the meeting, which contrary to speculation was not attended by Anil Ambani. There was perceptible excitement among shareholders as Mukesh walked in to the Birla Matoshree auditorium, flanked by wife Nita and mother Kokilaben, and the packed-to-capacity hall burst out in applause when he announced that he looked forward to a "harmonious and constructive relationship" with ADAG. Mukesh did not mention Anil, 51, during his over one hour speech and instead only referred to ADAG. RIL, he said, was ready to supply gas to ADAG's power plants, including the proposed 7,800 MW at Dadri near Delhi, as and when they are ready to receive the fuel. The supplies would, however, be subject to the government allocating gas to ADAG plants like it has done for all of the over 60 million cubic meters per day of output from KG-D6 fields. Weeks after the world's richest siblings decided to scrap a 2006 accord that barred them from expanding into each other's businesses, RIL said it has planned "mega investment" in thermal, hydel and nuclear power generation. In telecom sector, which along with power was hitherto the reserve of Anil Ambani under the 2006 non-compete accord, RIL plans to offer fourth generation wireless infocomm services across the nation using the 20 MHz, contiguous, pan-India spectrum it got with acquisition of 95 per cent stake in Infotel Broadband. RIL will expand energy exploration off east coast and plans to drill in East Timor, Yemen and Oman as well as add shale gas assets, Mukesh told shareholders. "We are drawing up specific plans for mega investments in this (power) sector with clean coal-based power generation projects, hydel projects and also in nuclear power as and when it is opened up," he said. Mukesh and Anil fought a bitter battle over gas supplies from KG-D6 both in and outside the courts where the younger Ambani claimed fuel as per terms decided in 2005 family agreement that split the Reliance empire between them. Under that agreement, Mukesh kept the petrochemicals, oil and gas units and Anil got the power, telecommunications, financial services and entertainment units. RIL opposed Anil group's demand for gas supplies saying government alone had the right to price the fuel and fix its users. "The Supreme Court upheld, in most parts, the stand of RIL. It has always been our position that we are, and continue to be, governed by the provisions of the Production Sharing Contract in all respect of the petroleum operations carried out by us. "We have also been fully conscious that the Government of India has more than a significant say in these operations," Mukesh said. He termed as "game-changing development" the annulling of earlier non-compete agreement between RIL and ADAG and replacing it with a new one. After scrapping of the 2006 non-compete agreement, RIL on June 11 acquired an Internet services company for $1 billion. "This new agreement opens up the full range of power business for RIL, except non-captive gas-based power plants until 2022. This paves the way for Reliance to participate in the whole value chain of power business, spanning generation, transmission and distribution," he said. "We see and unbounded opportunity in this space." Sources said RIL may be planning 20,000-30,000 MW of power plants over next five years. While Ambani did not put a figure to the investment for its power foray, sources in know said RIL may be planning $10 billion spending, including on bidding for the government's planned ultra mega power projects in Orissa and Chhattisgarh. "We are ready to bring into full play our investment mobilisation capabilities, as well as our superior project execution capabilities, into a sector that is crying out for transformational mega initiatives," he said. RIL, which recently acquired 40 per cent interest in shale gas assets of Atlas Energy of US, said it "aspires to build a significant position in the shale gas business."